Batcave Toy Room - Better Living Through Toy Collecting: Zop! Pow! Bam! These Nails Could Give Catwoman a Run For Her Cat Nip. Zop! Pow! Bam! These Nails Could Give Catwoman a Run For Her Cat Nip. Hey Bat Fan's! We all loved when the "Wham's" and "Bam's" would pop up during a bat fight on the Batman TV Series, but take a look at these nails. 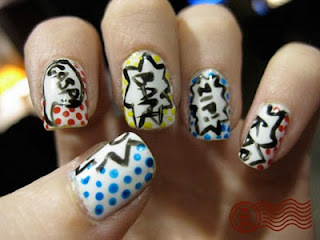 Melissa over at The Daily Nail creates a new nail design for herself every day and today she chose to do a set comic balloons filled with Bam's, Gasp's, and Kapow's. Check out her site at daily-nail.blogspot.com. It's fun to see what she comes up with next.